Towering over seas of greens and blues, scaling Pico de Loro is the highlight of a climb to Mt. Palay Palay. The monolith stands imposing and dramatic amidst the plains of Cavite and the waters of South China Sea. They say conquering the parrot’s beak takes skill and experience. It may not be for the faint of heart, but for the daredevils, the peak is surprisingly easy peasy. :) Its intimidating appearance sets off some climbers who settle for the actual peak of Mt. Palay Palay before proceeding through a steep path and crossing over to the rock. At its base, there is a short portion where makeshift steps jut from the side of the rock and where a rather beaten rope was installed to aid the climbers. These make the climb up the monolith not too difficult. Careful steps must still be on top of mind as a slip to the right will send you plummeting a good hundreds of meters to the ground. 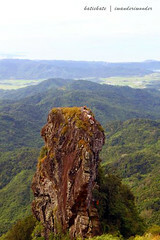 On top, rigid and appearing too vertical as a tower should be, the rock formation can be a good venue for rappelling. In fact, when we were there, a group was trying it out at Php250.00 per head. Aside from the monolith, another sidetrip to complement a Mt. Palay Palay climb is a dip in the waterfalls which can be found about ten minutes off the main trail. Accessible at two to three hours away from Metro Manila, a dayhike or a weekend in Mt. Palay Palay and Pico de Loro is easily a favorite for a quick weekend respite. To get to this part of Cavite, take a Ternate-bound bus from Manila and hire a jeepney to take your group to the DENR station and jump-off point.